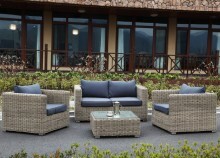 The GetFurnished.com online shop offers very beautiful garden furniture for rent. By choosing one of our lounges, you can design your garden as you wish without having to spend a fortune. For periods ranging from 1 to 36 months, enjoy the sunny weather and treat yourself to the garden furniture you like. Arrange your terrace for a summer or all year round with our collection of garden furniture. Design, traditional or natural, many styles of garden furniture for rent are available on our online shop to share a good meal or to discuss and spend a pleasant moment with your family. Well arranged, the garden is a space that makes you want to rest, relax with friends or family, celebrate and enjoy beautiful moments with those you love. Choose to enjoy the space in your garden by having one of the beautiful lounges in the GetFurnished.com online store installed. Delivered in a maximum of 48 hours, you can enjoy comfortable and very stylish furniture. The flexible contract offered to you even allows you to change the chosen lounge whenever you wish. Why rent a garden furniture? Would you like to receive people in your garden for a defined period of time? You are passing through a house for a short time, but you still want to settle down? Perhaps you are still an event professional? Renting garden furniture with GetFurnished.com online store is an excellent option. There is no need to invest large sums in the furnishing of your home. In either case, the garden furniture you will find on this shop is a great deal! - The Price: On the price side, you are likely to be pleasantly surprised by the small monthly payments offered by the GetFurnished.com store. The most beautiful and trendy furniture is available at low prices. - Quality: The speed of the service and the quality of the articles will leave you totally satisfied. Rely on durable items for pleasant use throughout the duration of your contract. - Simplicity: No need to worry about moving or delivery issues. GetFurnished.com takes care of everything for your peace of mind. An efficient and simple service is offered to you for your satisfaction.